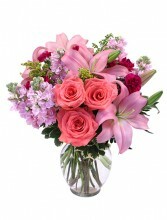 Teleflora's Country Sweetheart Bouquet in Bradenton, FL - TROPICAL INTERIORS FLORIST INC.
Sweet as can be! 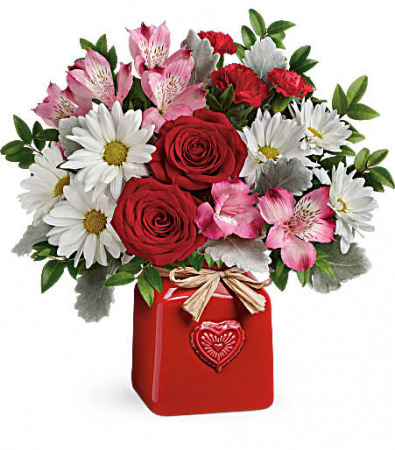 Surprise your sweetheart with this cute, country-style bouquet of red roses and white daisies, delivered in a cheerful ceramic crock with embossed heart and Italian raffia bow. This bouquet includes red roses, pink alstroemeria, red miniature carnations, white daisy spray chrysanthemums, dusty miller and huckleberry. 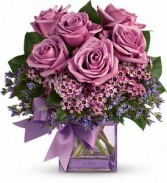 Delivered in a Country Sweetheart Crock.